The ATCO Queen Elizabeth II Cup (1.60m) was fully subscribed with fifty top international horse/rider combinations ready to take on the track designed by FEI course designer Santiago Varela (ESP). 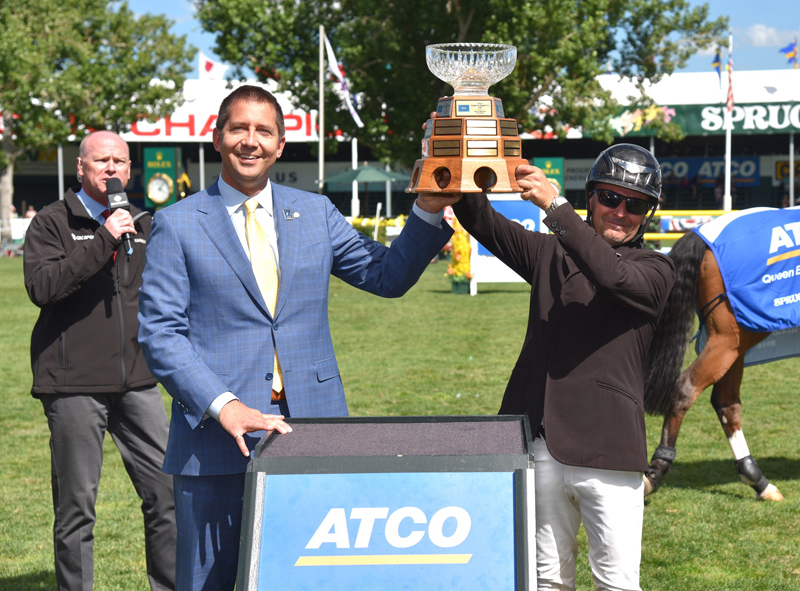 The ATCO Queen Elizabeth II Cup is a two round Grand Prix. Following the completion of round one, the top 12 riders (or all those who posted clear rounds in round one) come back to compete over a second round. At the completion of the second round, any riders tied for first place proceed to a jump off. The first clear round of the competition came early from Andrew Wells (USA) who was third into the ring. Overall eight horse/rider combinations would jump clear with Lorenza O’Farrill (MEX), Paricio Pasquel (MEX), Molly Ashe (USA) and Rowan Willis (AUS) rounding out the top twelve going through to round two. Former champions Eric Lamaze (CAN) and Kent Farrington (USA) were among those in the top twelve riders from round one advancing to the second round. The rails stayed intact for Enrique Gonzalez (MEX) but a round two time of 68.67s would cost him one time fault. Lamaze stepped into the ring with Fine Lady ready for the challenge and posted the first and only double clear of the day. This is Lamaze’s fifth win in the ATCO Queen Elizabeth II Cup. Riders competed earlier this week to qualify for the Imperial Winning Round (1.50m) with only the top 30 riders based on their placings from the Kubota Cup (1.50m) and the AON Cup (1.50m) eligible to compete today. Canada’s Tiffany Foster and the quick gelding Brighton won the event in both 2016 and 2017 and were looking for a hat trick win in today’s event. The top ten results from round one would come back to compete in the Winning Round including fan favourites Kent Farrington (USA), Eric Lamaze (CAN) and sneaking in in tenth, last years winner Tiffany Foster. A rail in round one had Foster coming back into the first in the Winner Round, but she laid down a clear ride in the Winning Round with a time of 55.90s. The remainder of the field was working hard to catch Foster’s fast time, and she held onto that lead until the final horse. Farrington was the only thing standing between Foster and her victory. He and the nine year old stallion Jasper left nothing on the line posting a clear ride with a time of 53.90s to take the win. For results from Saturday’s competition at the Spruce Meadows North American, click here.